As an eminent Dry Coating Lamination Machine, Manufacturer, Exporter, and Supplier, of India, we are engaged in presenting Dry Lamination Machine. These machines are designed for laminating various combination of flexible substrates for packaging with minimum labor and time. Our rage of Dry Lamination Machine has additional facilities such as Silicon coating, Adhesive coating for tapes, stickers and heat shrinkable coating on polyster foils and OLB. 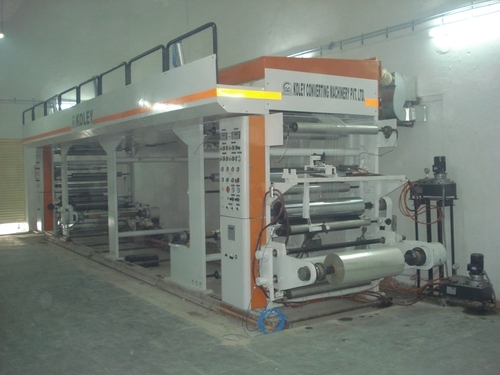 Our range of machine are best known for attributes like superb performance, supreme material quality, convenient to utilize, cost efficient and reliable and the likes. The Wet and Dry Coating Lamination Machine specially designed multipurpose with additional facilities like Silicon coating, Adhesive coating for tapes, stickers and heat shrinkable coating on polyster foils and OLB. The machine is made up of C.I. heavy body. Pneumatic system can be fitted at no extra cost. It has a very comfortable exhaust system for solvent fumes. Tention control and web guide can also be provided at no extra cost. Films, Paper, Aluminium Foil, etc.